Expert allows CLEVER to be run directly from the currently-editing cell, or its clipped-out rectangular area. 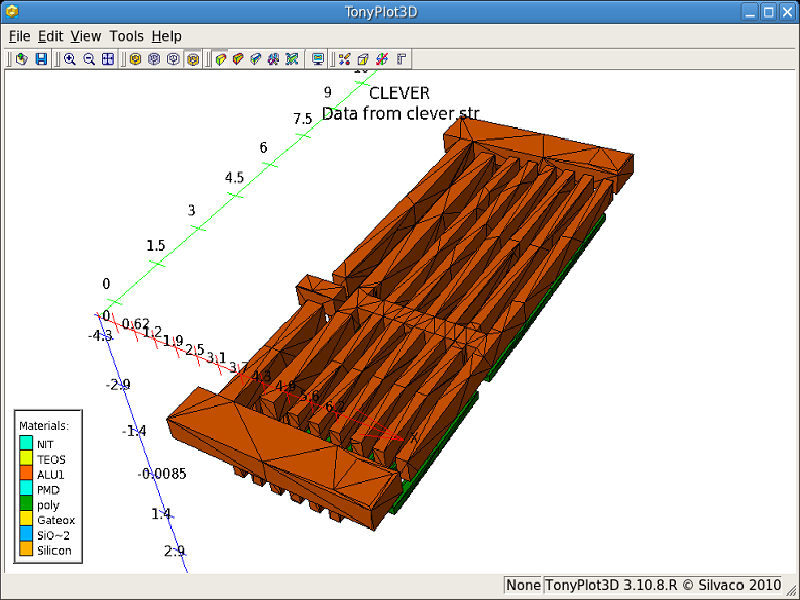 It uses an already-existing CLEVER input deck, and generates 3-D interconnect structure which can be displayed in TonyPlot3D. Parasitic capacitances and resistances can also be calculated on the generated 3-D structure based on the 3-D field solver using CLEVER. By adding appropriate commands in the input deck, CLEVER can generate electrodes from normal text objects put in the layout. Start Expert and select File->Open to load the GDSII file integration_ex05.gds without a technology file. A dialog box will appear to inform you that no technology file is specified. Click OK to proceed the operation. 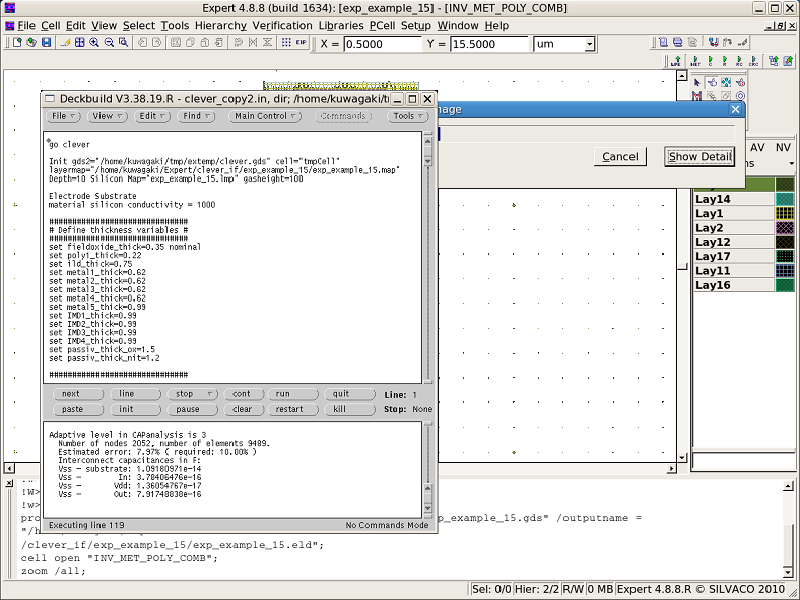 Open the top cell INV_MET_POLY_COMB in Open Cell(s) dialog (see integration_ex05_1.png ). Select Tools->3-D Image->Setup to open the DeckBuild setup dialog (see integration_ex05_2.png ). Specify the CLEVER input deck integration_ex05.in in the Input file text field, and the CLEVER map file integration_ex05.map in the Map file text field. Also specify the output file integration_ex05.out, which does not exist before this example is run. Select Tools->3-D Image->Cell . 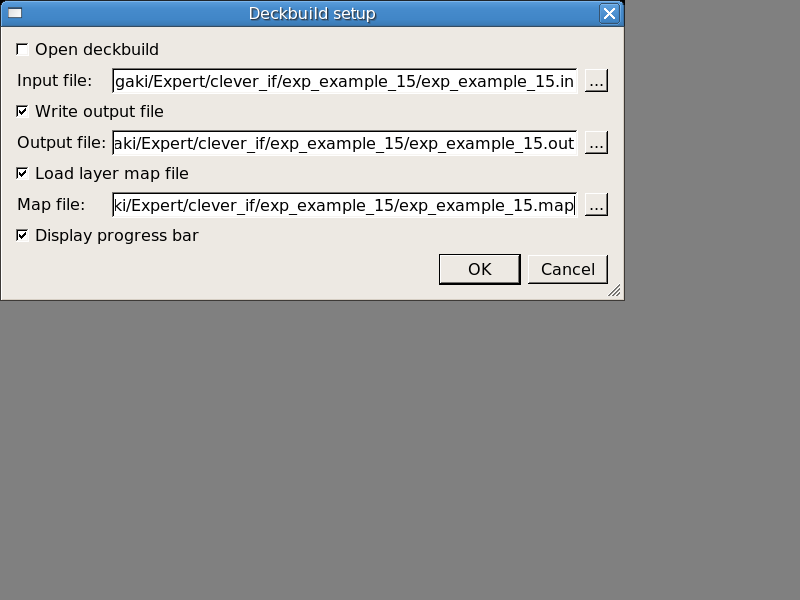 First, the DeckBuild window will appear, and CLEVER will run in it (see integration_ex05_3.png ). As soon as CLEVER finishes the processing, TonyPlot3D will appear to show the generated 3-D structure (see integration_ex05_4.png ). 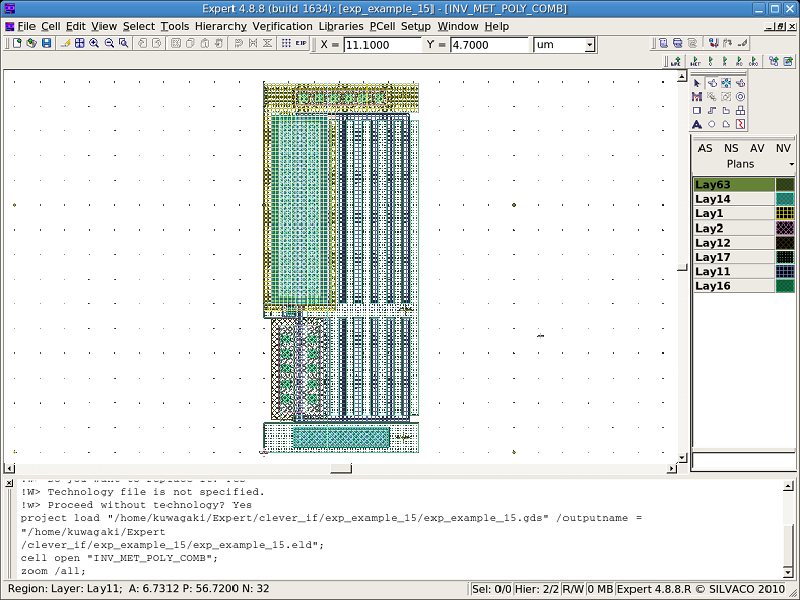 Select Tools->3-D Image->Clip-out and specify a rectangular area overlapping a part of the layout. 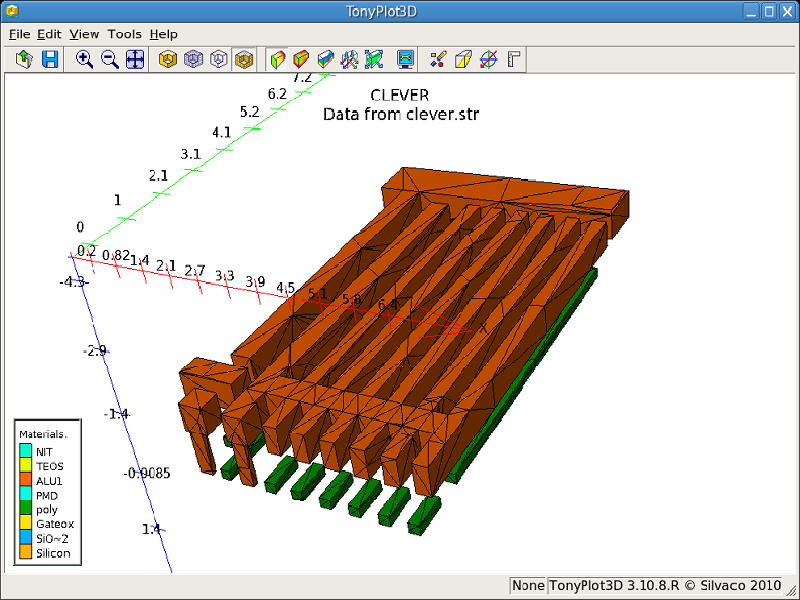 CLEVER will be executed again for the specified area, and Tonyplot3D will show the resultant 3-D structure (see integration_ex05_5.png ). Interconnect Resistance AdaptR=0.10 MinRES=1 structure="res"
# First a calculation is made with 5% for every electrodes. Interconnect Capacitance AdaptC=0.10 capsolver=1 structure="cap"
# Then Vdd since the precision asked is higher.